When selected barrels of our Rested American Whiskey have completed their time in Missouri White Oak, we transfer the spirit to a 60-gallon Radoux French Oak wine barrel in which Stone Hill Winery’s award winning 2011 Port was aged. The barrel’s history and provenance are key to this whiskey’s flavor profile. Stone Hill’s Port is aged for one year in barrels that came out of the winery’s Norton aging program. Norton is generally recognized as Missouri’s finest red varietal wine grape, and Stone Hill’s Norton has been winning gold medals for decades. Barrels are only used for three vintages. The freshly emptied port barrels are immediately filled with Pinckney Bend’s Double Gold winning Rested American Whiskey at 120 proof and placed in a temperature controlled barrel room. Over time the whiskey begins to take on some of the distinctive blackberry and cassis notes of the wine, and the color takes on a reddish hue. Oxidation also occurs, which is equally important to flavor development. Released at 100 proof, this is American whiskey made from corn, and cask-finished in a time-honored Scottish style that reaches back to the very roots of whiskey’s history. 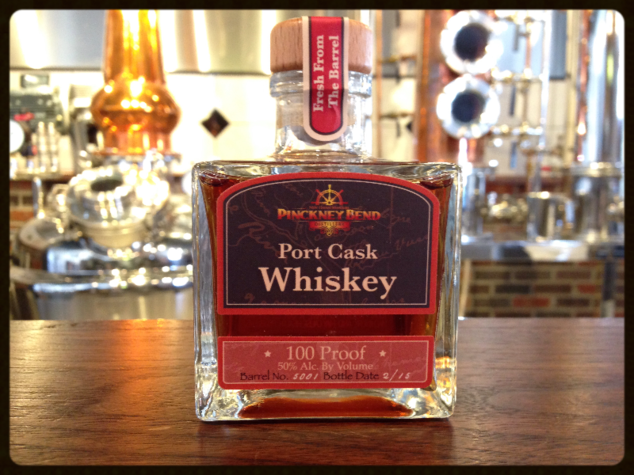 As with all our small batch Cask Series Whiskies, quantities are limited, and it is only available at the distillery.